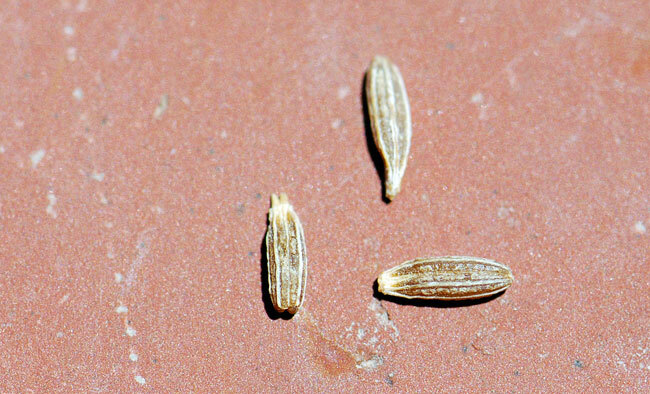 Our mystery seeds from last week were indeed from cumin, Cuminum cyminum. Unfortunately, I don't have any photographs of the plant. Cumin is native from eastern Mediterranean region east to India, so it shouldn't mind a dry climate. It is supposed to like heat, too. When I tried to grow the seeds, however, the plants dried up. I'm not sure whether it was the wrong planting date or the watering system failed. 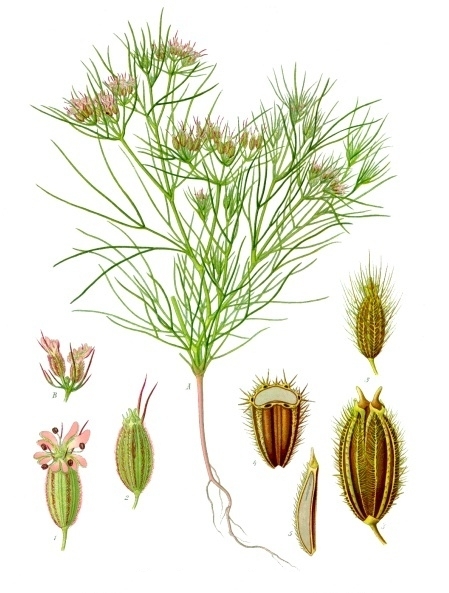 I was able to find this illustration of the cumin plant from Wikimedia. As you can see, the leaves of the cumin plant are lacy, rather like dill. The flowers are either pink or white. Both the seeds and ground seeds are used extensively in cooking, particularly in Indian curries. It is also used in Southwestern cuisine, from tacos to chili. Have you ever grown cumin? Do you have any tips?